8 Metre Runner Tails are one of the highest loaded ropes on the boat and are loaded and released hundreds of times during a race day. We recently carried out a custom project to produce a set of runner tails in time for the 8 metre world championships in Germany. We worked with our partners Southern Ropes to produce this product quickly. We selected a Super 12 core (SK78), low stretch and a good break load to allow us to reduce from 12mm to 10mm diameter. 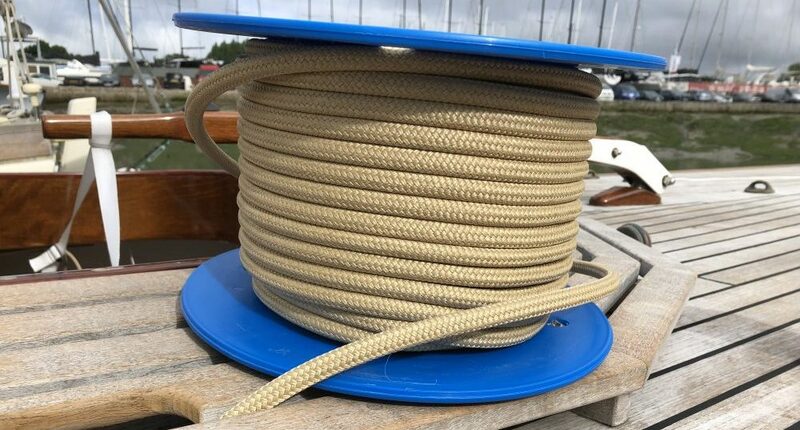 The drop in diameter made a big difference to the speed of releasing when then boat sails downwind and 20 meters of rope runs through all the purchase systems! For the cover a polyester/technora blend was chosen, the boat had previously used 100% polyester covers and this just wasn’t tough enough. We also increased the thickness of the cover to further improve the abrasion resistance of the rope. Getting the aesthetics of the rope right caused the biggest problem. Technora yarns can vary in colour quite dramatically. Southern Ropes produced a few samples with different batches of technora. We used a higher grade of technora to get this correct in the end. We were really thrilled with the result! We finished the rope off with a covered eye splice, a dyneema chafe sleeve as the rope passes through the deck and also calibrated whipping markers. 3 weeks of continuous sailing for the boat and the rope has shown great results!